A breath-taking weekend of Premier League football that has been bombarded with goals concludes with the epic showdown between the two most prestigious clubs in British footballing history: Manchester United and Liverpool. This is simply more than just a fixture. Our rivalry with Liverpool is one that has captivated the league throughout the years. Two of the largest towns in England have a monumental collection of footballing glory and these two clubs have competed on the biggest stage. 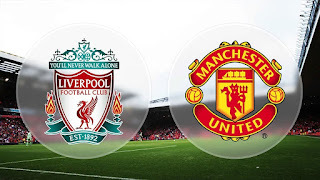 The Red Devils of Manchester and the Reds of Liverpool have produced some truly magical moments over the years, every fixture is an exciting one filled with nothing other than beautiful football. Without a doubt this season has been one of the most spectacular, shocking seasons in terms of results and positions of clubs. Liverpool are currently 9th but only 4 points off 5th placed West Ham whilst the Red Devils are 6th- 5 points of Tottenham in 4th place. Both teams featured in entertaining 3-3 draws during the week where Roberto Firmino of Liverpool was particularly impressive with two terrific goals. 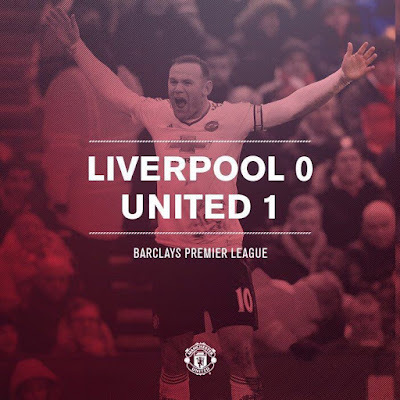 Wayne Rooney proved why he is captain and showed just what he is capable of after scoring two goals; a brilliant penalty and world-class curling strike from outside the box. Tuesday’s game against Newcastle showcased the improvement of our team going forward and being able to score goals although we are still lacking a winning mentality that is needed in order to be successful in the league. Also, we showed that our defence is not quite up to scratch, conceding three goals. Jurgen Klopp’s arrival to Anfield has certainly changed the dynamics for the club and really galvanised their players. They worked hard to secure a draw after a goal from Joe Allen although today’s game will be difficult for them considering that they have just played Arsenal. 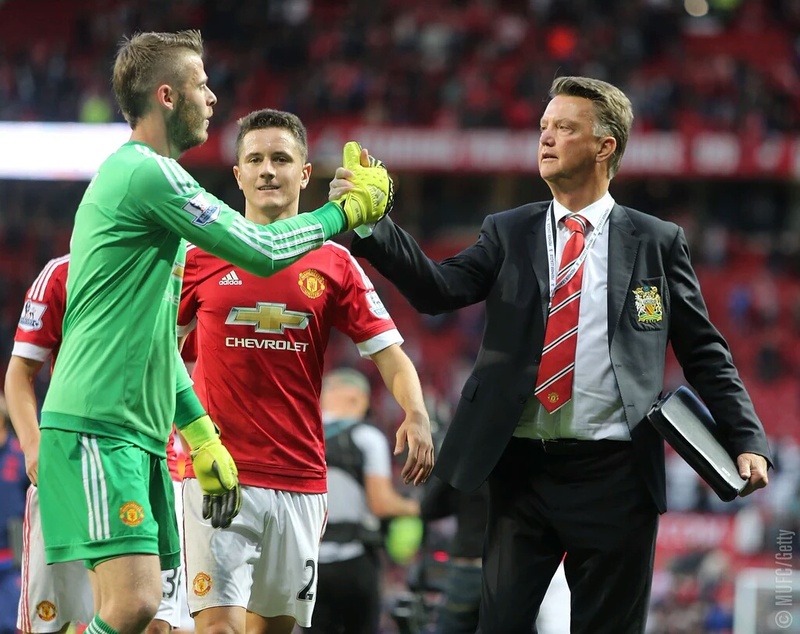 LVG on the other hand needs consecutive wins under him to really ease the pressure that is on him. One thing that we can all be sure of is that the game today will be intense, passionate and aggressive. Hopefully there will be stunning goals scored tomorrow but most importantly, United take 3 points back with them to Manchester. Anfield as we all know has witnessed some fabulous football, a fantastic stadium but one which we have won at on numerous occasions. 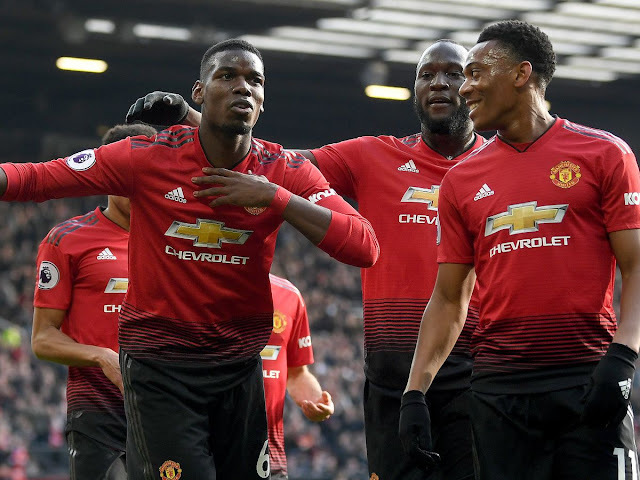 After drawing against Newcastle in a game which we really should have won, United will be desperate to take all 3 points. Rooney was involved in all of our goals and produced a delicious assist for Lingard who scored and played well. Our inability to dictate games in the latter stages and take our chances has meant that we are now 10 points behind league leaders Leicester City- a gap which is becoming increasingly harder to narrow. 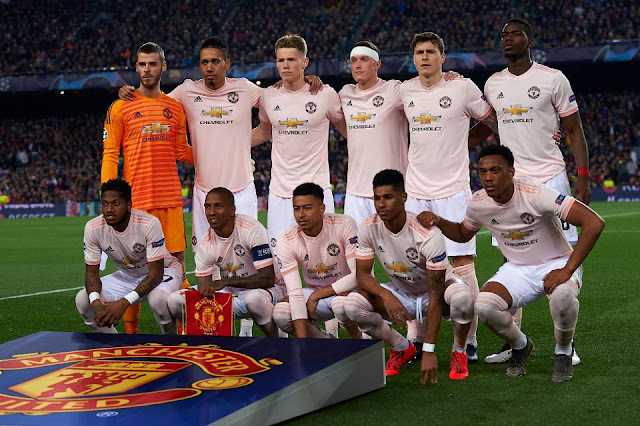 In terms of team selection, our problems lie within the defence so I expect LVG to keep our attack the same as the previous game but make changes to our defence. 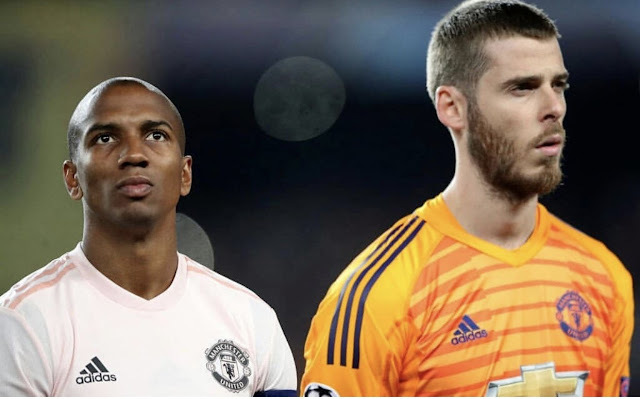 Especially with the attacking threat that Liverpool pose, I would like to see our defence consist of: De Gea, Darmian, Smalling, Jones and Young. In midfield we will be without Schweinsteiger and Carrick due to injuries but Herrera, Mata, Fellaini and Lingard in midfield with Martial and Rooney upfront. Both teams are chasing a top-four finish so it will be interesting to see how the teams line up. Liverpool’s problems have ranged from their injury nightmares, particularly hamstrings, their defence and in particular goalkeeper Mignolet. If Klopp’s side are serious about playing Champions League football next season, then he will need to buy a quality goalkeeper since Mignolet just is not at that level. Liverpool drew to Arsenal but conceded poor goals it will be intriguing to see whether Liverpool are attacking (trying to expose our defence and get goals) or defensive (to try and nullify our attacking threats. Match day! We have our rock in goal which is nice to see always, and we have Smalling in CB to help him out. 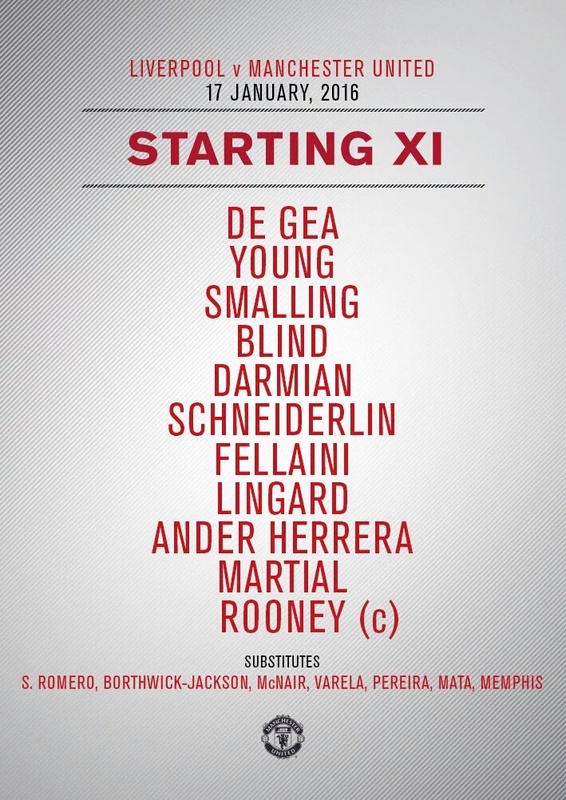 Smalling made a couple of key mistakes against Newcastle so let’s see if he can hop back from that and help us keep a clean sheet today with the help of Blind. 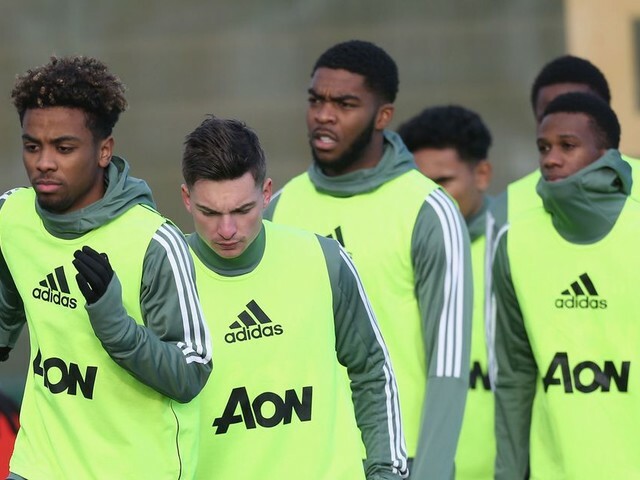 We have Darmian and Young as our full back’s today and seeing as they’ve both been in fine form recently, this is a good combination to go with. 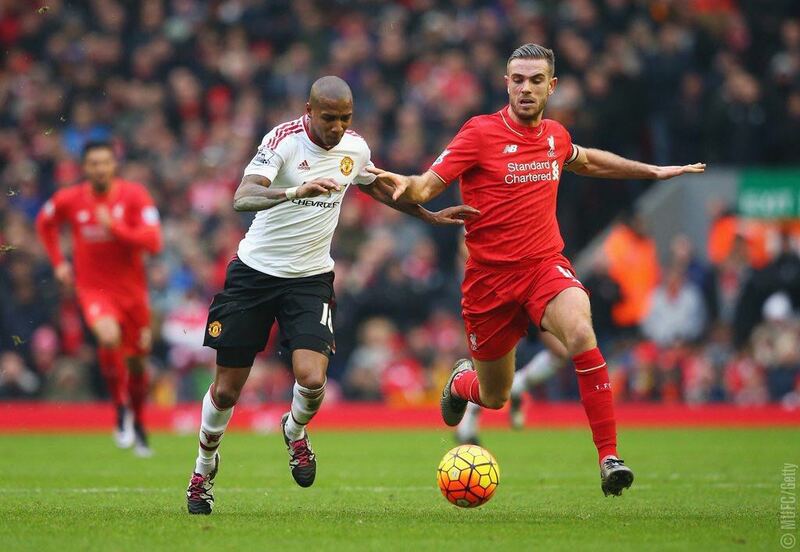 We know that Van Gaal means business today as Schneiderlin and Fellaini are in the holding midfielder’s roles in order to boss the midfield so that Liverpool won't run over us in the centre like they did to Arsenal. Schneiderlin has to make sure to keep Fellaini in check and in position so that he’s around to help deal with the counterattack. 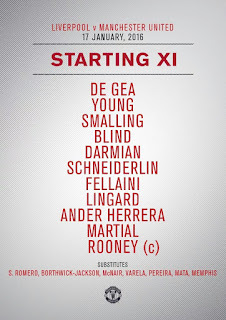 I’m thoroughly disappointed to see Lingard playing instead of Mata today. 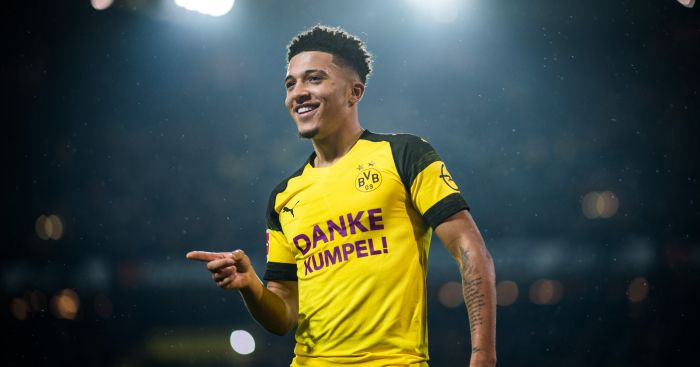 He’s always shown us that he can be the difference in the big matches and we need one of our best players today to help pierce their defence (Something Klopp would have definitely worked on after conceding three goals in midweek). 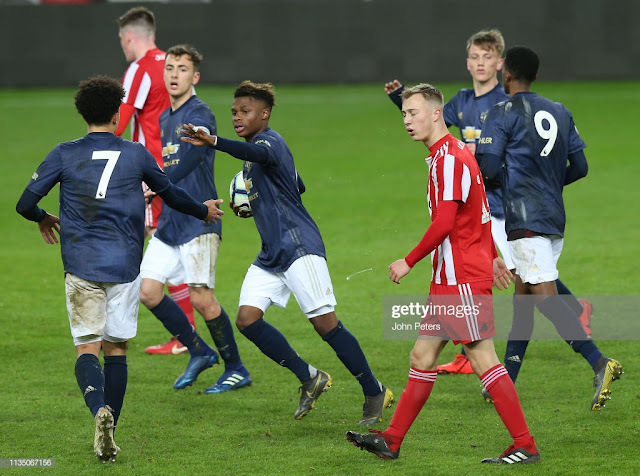 All's not lost though as Lingard has shown the type of creativity that only young players seem to show and has made very fast and promising runs with or without the ball. I’m happy that Herrera’s starting as he’s one of the most passionate players in the team and will not hesitate to take the long shot if he thinks it’s there. He also plays some key passes at crucial times and happens to be in the right place at the right time. Rooney looks to continue his fabulous form and Martial is out to replicate what he did on his debut. One thing’s for sure, he will be making runs into their defense all day. 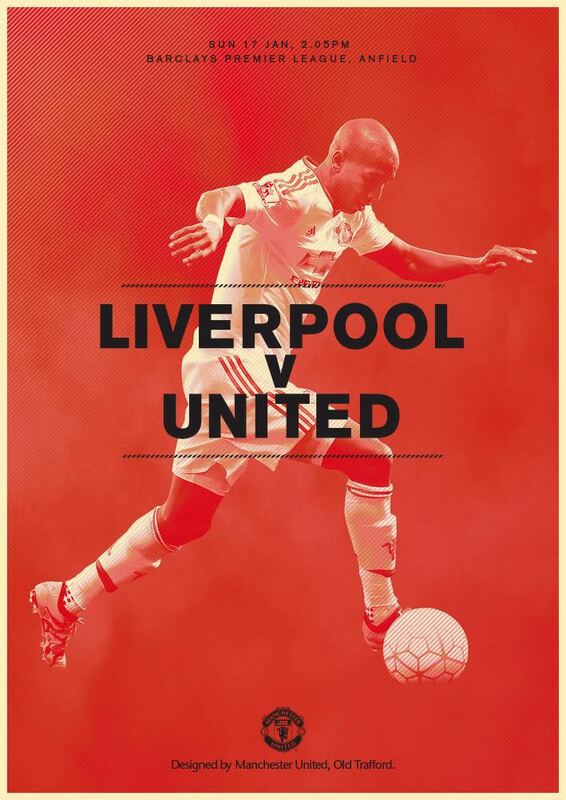 Let’s hope for an entertaining match and a great result, and take three points back to Manchester! Well, we haven’t had a foot in this game. We’ve been constricted in every part of the pitch and they’ve picked us apart defensively a few times but have failed to capitalise. They are pressing so much that none of our players have had any space to work and hence have looked sloppy in possession. Fellaini has looked like he is close to getting booked after a couple of altercations and Van Gaal should seriously consider taking him off since he hasn’t been key in set pieces or attacking either. It’s a wonder how Mata didn’t start. Herrera and Martial are finding it difficult to get into the game, and for me - Fellaini and Lingard need to come off for Mata and Memphis. We haven’t had a shot on target and that’s alarming. Rooney seems to be getting long balls thrown at him, but this is obviously not working as he has no backup. When we do get posession and a little bit of respite, we try and slow down the tempo, which is good in order to regain control - however they’re not tiring and we need to just hit them on they counter. In the second half, I think that we need to just weather the storm and then hit them with pace on the break which I think is our best chance of rattling the cage in this match. 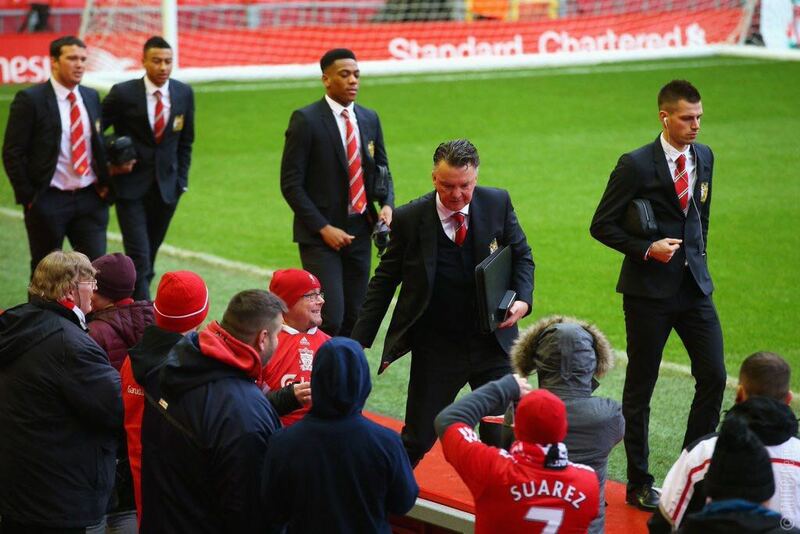 Let’s see what Van Gaal comes up with to combat this difficult Liverpool side. The second half was more eventful for both teams however both teams for large portions of the half lacked the clinical finish. However Liverpool came out playing much more positively and with a clear focus on scoring goals early on. David De Gea had to come out and pull out some incredible saves to deny Emre Can twice. We're back to playing boring possession football. This will be hidden by the fact that United have won. Our defence is looking a lot more nervous than a couple of months ago. We let 3 goals in against Newcastle and we could have let in a lot more goals if not for our world class goalkeeper. Smalling looked troubled by Firmino's pace and Lallana looked like he was never marked, he was everywhere dictating the pace of the game. Schneirderlin looked anonymous apart from making a couple of tackles here and there. 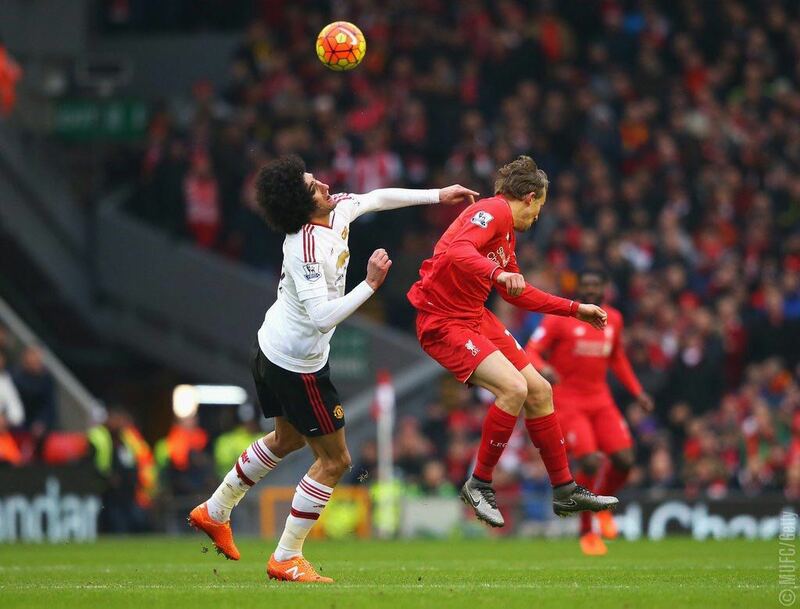 He didn't help to dominate the aerial battle, Fellaini did. 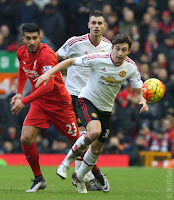 Darmian again looked a little bit nervous and he was definitely worked with all the running he had to do to keep track of Lallana (unsuccessfully). The goal came from Ibe falling asleep from his defensive duties and not marking Mata who whipped in a great ball for Fellaini, who was unlucky not to score as his header rebounded off the cross bar right into the feet of Rooney who blasted the ball into the back of the net. Rooney's poor form which he displayed at the first half of the season is now fading away and is being replaced by much better fortune, to the delight of us United fans. Overall this was an undeserved victory, Liverpool had many more chances than us in the first and second half and were only unable to score because of De Gea. The only stand out performance came from David De Gea as he repeatedly denied Emre Can who would've scored if anyone else was in goal. Thank God for that faulty fax machine in the summer! Where would we be without him, he's probably won us more points than our attacking players have won from scoring goals. I felt that leaving Ander Herrera on would have been more effective as he can pick a pass and play it, he also can run with the ball without being dispossessed unlike Memphis. I really worry for the guy. Fellaini put in a decent performance however he only offers us dominance in the air and he plays very riskily, receiving bookings far too often. To improve I believe we should keep on playing Schneirderlin even though he didn't play amazing. He will only improve as he gets more game time especially after being out for a while. 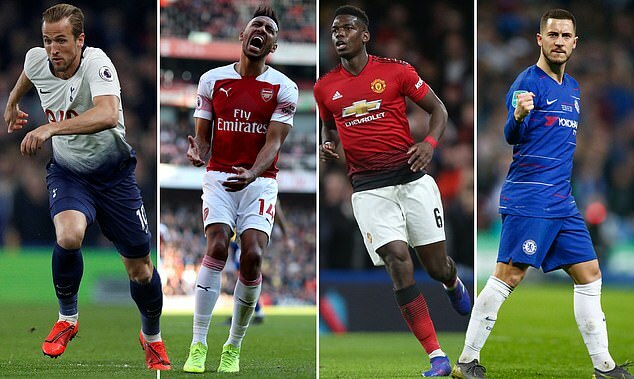 In addition I stress the fact that we need to find the defensive form we once had at the beginning of the season, as we are letting more goals in and this will help our goal difference which can help us later on. Undeserved victory but we've got the 3 points which has helped us climb to fifth place. Can't argue with that. 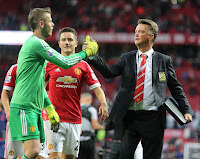 David De Gea: Another good day at the office for De Gea, He won man of the match due to the crucial saves he made. Where would we be without him? Ashley Young: He had a decent game today and was substituted early on due to an injury.. Slightly over-complicated at times but he should be out on the wing, not in the right back position. Would've liked to have seen him make more crosses. 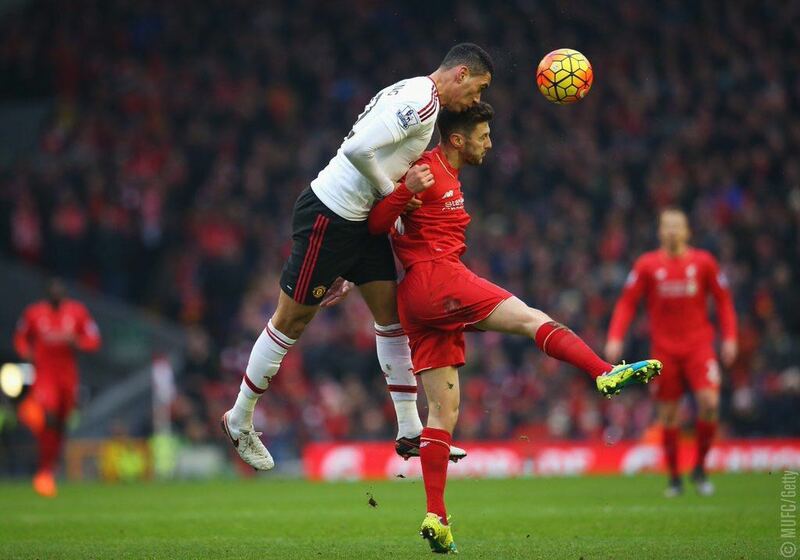 Chris Smalling: Didn't look as confident today but didn't have a bad game. Managed to keep a clean sheet and that's all that matters. Daley Blind: Didn't see much of him during the game. One thing that we can recall is his terrible corners. Defence was shambolic at times but somehow we managed to keep a clean sheet. Matteo Darmian: Played well in both the left back and right back positions and did make some vital tackles. Would like to see him drive some crosses into the box more often. 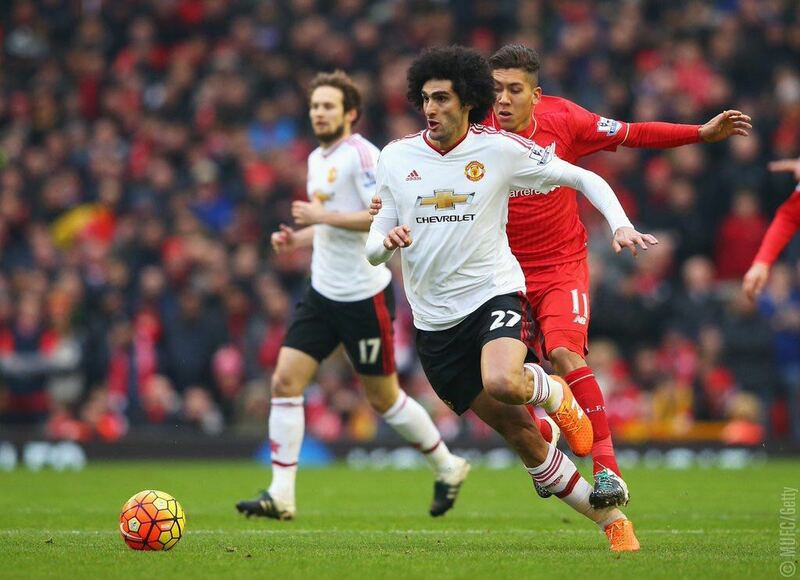 Fellaini: Once again, didn't have a good game. Couldn't keep a calm head. 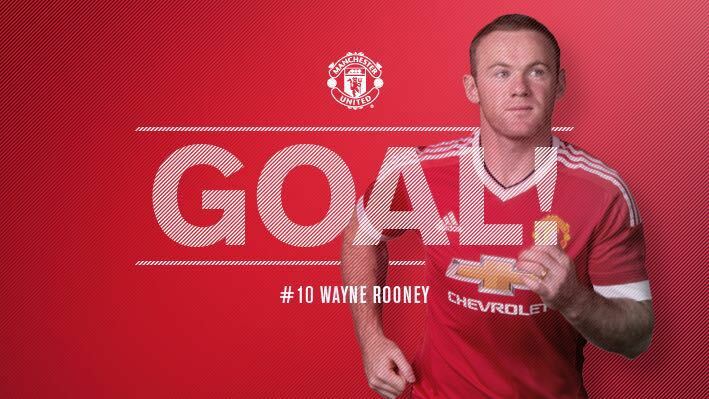 However, it was his header that struck the crossbar that directly led to Wayne Rooney's goal so thank God for him. Schneiderlin: Wasn't as influential as he would have hoped today but done the job well and applied pressure to Liverpool. He didn't manage to dictate the midfield and won barely any of the battles in the air. 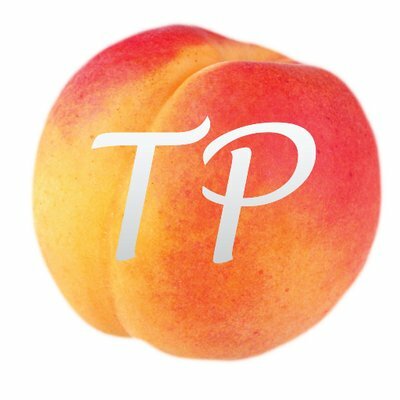 Lingard: His movement was good today but was sometimes sloppy in possession and it would've been good to see him have a shot today. 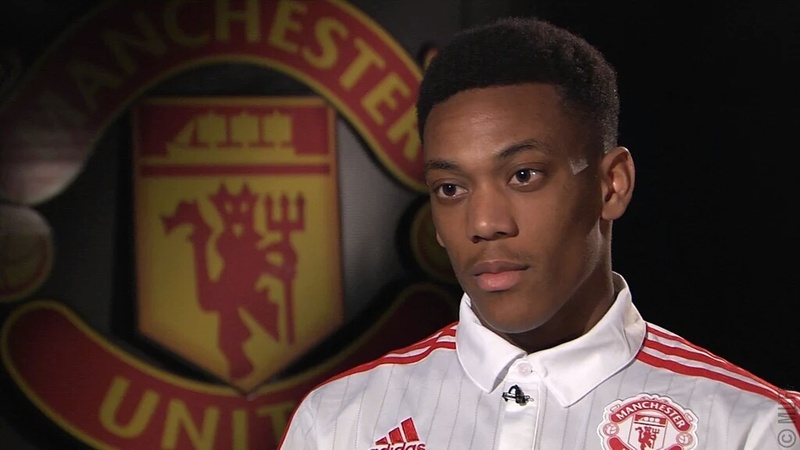 Martial: Once again played on the wing and put in a decent performance. However, Klopp clearly pointed out his threat before the game as whenever he got the ball, the Liverpool players pounced on him. Ander Herrera: Didn't play well at all today, but he is clearly a fan favourite as you could tell when he was subbed. He is expected to be the creative mastermind in midfield, but was passing sideways and backwards today, and that's not what we like to see. Wayne Rooney: He's continued with his terrific form from the last two games and snatched the winner. That's 4 goals in 3 games for our skipper. Today's goal has made him the top goalscorer in the Premier League for a single club. Memphis: Didn't get enough time to make an impact today. During the game there were times where nobody was prepared to be creative, take a man on or shoot. Hopefully LVG has realised that we need him, and will start him on Saturday against Southampton.